For many of us, September is a strange month – usually defined by adjusting to Autumnal weather and getting back into the day-to-day school/work routine. We’ll soon be waving goodbye to warm evenings and al fresco drinking, picnics in the park and juicy seasonal fruits. I’m personally looking forward to bringing the party back inside, Autumn is the perfect time to embrace social gatherings around the dinner table; who doesn’t love getting cosy with a glass of wine in hand?! I’ve compiled a list of things I’m currently loving and looking forward to this month, what’s on your agenda in September? If you’ve had a chance to visit Clapham foodie favourite The Dairy, you’ll already be familiar with Robin Gill’s incredible food. I love a good cookbook and Robin recently released Larder – a book brimming with stunning seasonal contemporary British dishes using traditional techniques. 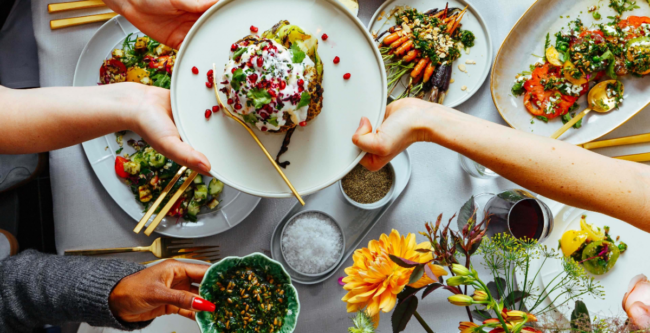 One of life’s greatest pleasures is finding happiness and contentment through good food, so let me and NOT PLANT BASED’s Eve Simmons take the lead with a super fresh supper to help remove stigmas around disordered eating. Tickets here. I recently took my brilliant Social Pantry event planners for dinner at newly opened St Leonards in Shoreditch and I couldn’t recommend it enough. The latest venture from the team at Brunswick House (Andrew Clarke and Jackson Boxer) if you only visit one place in London this month, make it St Leonards – you won’t regret it. Vegetarians often get overlooked at dinner parties, this Middle Eastern inspired dish is not only a delicious main for any non-meat eaters but makes a gorgeous side dish too… Find the recipe here. As the days start getting shorter and darker, I’ll soon be swapping bare legs and sandals for trousers and boots. Until then, these super fun Great Plains baby pink cropped cords are the perfect transitional item to see you through Autumn. I’ll be wearing mine with my favourite Veja trainers and a simple cotton shirt.